Continuing our series of articles by Mark Nolan, telling the story of his early days as a railwayman at Fearn Station on the Far North Line in the 1970s. Like any proper manned Scottish railway station in the 70s, Fearn had a symbiotic relationship with another service which was even more venerable and respected than the railways: Royal Mail. Highland posties are of course legendary; for that job you need a practical mix of energy, cheerful charm and resourcefulness. You have to be an excellent driver, willing and capable of being out in all hours and weathers, often the first up a snow bound track with an elderly person at the end of it. A vital part of the community, discreet, yet helping to join up the dots. Fearn Post Office was a utilitarian building just down from the bustling general store in Hill of Fearn, a convenient mile and a half from the station. In those days the sorting and delivery functions were naturally integrated with the counter services, rather than deliberately divided as they are today. It made sense in a rural setting. You could even give your postman a letter with money for the stamp, and he would happily stick it on and post it for you back at the office. 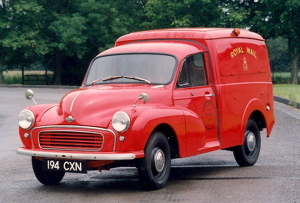 The classic, friendly lines of the red Morris Minor mail vans were a constant and welcome sight across the country. Our postie would collect the mailbags off the train each morning, head back to sort the mail, then out again to deliver the letters. Finally the mail which had been posted that day would be sent back to Fearn Station to be dispatched on the afternoon train. Consequently there was a mail van and a smartly turned out postman parked on Fearn's platform punctually every weekday morning and afternoon. It didn't take them long to notice the bright yellow caravan which had appeared on their platform. Once they'd stopped laughing I got to know them quite well, and they were really helpful. In the morning there'd be a rap on the caravan door, "Wake up Mark, the train's at Nigg!" All I had to do was throw on some jeans and a T-shirt, wipe the sleep from my eyes, step outside and I was at work. The postmen always seemed to know if the train was late, and by how much, so I never got woken up any earlier than necessary. It turned out that one of the postmen was the father of the drummer from the band I had been playing with, and so formed another connection which turned out to have a major influence on my activities later in the summer.